“You know, I used to be a very disciplined person,” my friend mused. We continued to chat about the way our productivity has taken a nose dive since our kids came along. So many people like us—people who used to be experts in planning, scheduling, and getting results—find that becoming a parent turns our brains and our calendars to absolute mush. But it doesn’t have to be that way. I’m finding I can still catch glimpses of my previously productive self when I focus on intentionally cultivating the productive habits that came naturally to me pre-baby, notably these twelve. 1. They have daily dedicated planning time. Usually 5-10 minutes in the morning or the evening is set aside to think through that day’s (or the next day’s) tasks and to outline a game plan for getting them accomplished. 2. They take care of quick tasks immediately. If a task pops into their mind and it requires less than 5 minutes of their time, productive people will attend to it right away, eliminating the need to write it down or try to remember it later. 3. They prioritize their to-do list. When the day’s list is too long to realistically complete in 24 hours (which for some of us is a daily occurrence), that list is then rearranged to reflect the absolute essentials. 4. They identify and utilize their productivity window. No one is at his/her best all day long. People who are on top of things know their most productive times—usually a 2-3 hour window that occurs once or twice a day—and intentionally use that time to tackle the most important tasks or the ones that require the most focus. For me it’s 9-11:30am, so I save my menial responsibilities for the late afternoon, when I tend to drag. 5. They know when (and when not to) multitask. Multitasking gets a bad rap, but highly productive people understand that sometimes it does work—like when you’re listening to a career-related podcast while wiping down your kitchen counters, or when you’re brainstorming project ideas while going for your morning walk. They also know, however, to differentiate between multitasking and just being distracted. Hopping on Facebook every 10 minutes at work? That’s the latter. 6. They use a planning/scheduling tool that works for their lifestyle. A diehard pen-and-paper person probably won’t be successful with an app-based system, while a true techie would likely lose that day planner within an hour. Similarly, someone whose schedule is closely tied to other family members’ responsibilities needs a system—be it a giant wall calendar for the kitchen or a family-organizing app like Cozi—that accommodates that lifestyle. It may sound counterintuitive, but working from sunrise to sunset does not a productive person make. Regular breaks for things like food, water, and movement actually make people more effective and efficient. 8. They’re realistic about how much time things take. If you underestimate how long it takes to, say, write that report or clean your house, you’re inevitably going to get behind. On the other hand, if you always overestimate how long tasks take, you’ll never be as efficient as you could be. Highly productive people find that sweet spot where they can accurately estimate how much time something will take, taking into account occasional breaks and inevitable interruptions. 9. They have someone hold them accountable. Highly productive people are open about what they want to accomplish that day, week, month, or year—and then don’t want to disappoint when others follow up. 10. They’re perfectionists, but only when it counts. 11. They delegate the right way. That is, they delegate a reasonable number of tasks that are appropriate to the skill level of the delegatee, and they always say please and thank you. 12. They appreciate what did get done instead of stressing over what didn’t. Like most things in life, being productive requires a good attitude. At the end of the day, looking at the bright side and choosing to see the accomplishments rather than the missteps means that you’ll feel better, sleep better, and be better prepared to be productive again tomorrow. While some of us innately have more drive than others, I still believe highly productive people are made, not born—and can be re-made even after the life-changing event that is parenthood! Which of these habits do you already have? Which one would you like to cultivate more? I like to knock out quick tasks immediately and I definitely know I’m a morning time. Having kids made me more efficient in some aspects – I dropped my perfectionism and honed in on getting stuff done, not getting stuff done perfectly. These come innately to me. #6 has surprised me in that we added a white board to our bedroom (Scott’s office area of it) and I love it! It was intended for him, but I’ve taken it over. I’m more comfortable putting tasks and thoughts there than on the fridge where they’d get lost or overlooked. I consider myself a pretty self-motivated person, but my organization has definitely taken a nose dive since having kids. These are some great tips and I can certainly learn from the last one; to appreciate what did get done instead of always worrying about what didn’t. I’ve become much better with 3 and 4, but I really could be better with 2 and 12. Those little tasks that I put off just kill me later! Great list…. I think I might be doing a couple of things right. Hey, this is totally awesome. I think I’ve gotten better at delegation and I do think my blog holds me accountable. I’ve been consistent for four years without one break! Hmm. maybe I’ll need one someday. I do have a designated time to work but that often gets interrupted. Sadly. Not a single break in four years? I’m equally impressed and horrified, haha. I won’t be shy: I’m actually pretty organized. I mean, there are days where it’s madness, but for the most part, I got this lol. The biggest thing for me is one of the things you mentioned: keeping a list. Or lists. I have a to-do list on my app. I have a physical notebook where I write down meals, and then a shopping list after that. I have a calendar for outings, both big weekend ones and small “after work” errands. Then there’s my blog, where I have a calendar to write down my blog posts, an excel file that’s really an editorial file where I write down blog posts, whether I’ve written a draft for it, typed it up, proofread it, researched it, attached an image, did SEO and links and edited it. I would be everywhere without my lists lol! With me, parenthood has made it even more crucial that I get my crap together more than ever. You’re right, Nina, you totally got this! Super impressed! If it is perfect ,it doesn’t meant it can’t upgrade!? What app do you use to write down your online to-do lists? I use https://kanbantool.com/ and I think it’s good, have you heard of it? Love this Katie!! As I was going through your list, I was nodding and feeling pretty good about doing ‘most’ of these things…. it’s 12 that gets me every day. Oh, how I wish I could embrace what IS done and not dwell in what ISN’T!!! It’s a very difficult shift in perspective, that’s for sure! Some of these I’m great at–some not so much. I’m great at making lists and prioritizing, but I’m really bad about getting distracted by tasks that don’t matter (like FB!) Working hard on getting more efficient so I’m doing tasks that matter–not just spinning my wheels! It’s tough to prioritize when there are so many things vying for our attention! I do all 12 of these naturally. Much less stressful then not planning. I also leave fun days or half days when I visit or have someone over for lunch or go antiquing or making time for a project we can do together. This tips might all be good. But finding your productive timeslot is pretty useless when you work 8-5 and than have to commute. By the time you get home all you want to do is lie flat und your back and have somebody else do your housework. I have days where I don’t even have enough energy to cook dinner – good for me I always have some prepared meals in my freezer waiting to be microwaved. It is so important that a planner fit your lifestyle. This gives me something to think about! I love being organized! I do some of these well. Others-I need to do a little more of-like taking breaks instead of sitting too long! It sounds counterproductive but it makes a big difference! I think I love the last tip the most, because celebrating what you did get done is an important of not getting lost in overwhelm when your to-do list is too big. I also love tip 2. If a task is only going to take me two minutes or less, I do it right away. Yep, those are two of my favorites as well! No. 10 and 11 very on point. I totally agree. It used to be my common mistake to make everything perfect before I go to the next task. But I always end up not finishing a lot. Awesome blog. Keep it up! Hi Katie I pinned this, started reading, and then realized “this is Katie’s blog!” These are great tips! I am pretty good at planning out my next day during the evening before I go to bed. I don’t know that I take care of quick task immediately though…I’m going to work on that. Great post! As a Mom, you may think you are accomplishing very little, but if you take stock of what you really do you will be surprised what you have accomplished. You may not think tending to those tears, settling those arguments, fixing those broken toys, doling out those snacks, reading those picture books and listening to your little one talk about what is important to him/her is productive, but you are accomplishing the very important task of raising a child. They grow up so fast! Amen! Thank you for this wonderful, supportive comment. Wish moms everywhere could read it! I am such a perfectionist, but like you pointed out, not when perfection does not matter. Then I just get it done. Done is better than perfect. Though a lot of the tasks are quite simple but it is the truth that we often forget these and hence end up cursing ourselves for being productive. I can never over emphasize the importance of having a to-do list. And today is the day when I can feel the importance even more. Basically my to-do list had the same tasks as yesterday so I didn’t bother to go through it in the morning and hence… I ended up not working on some very important things and wasting four hours. I could have avoided that with just a glance on that seemingly same to-do list. No? Loved this post and as a person who really suffers at being productive, I can say these things really help if you keep these in mind. It’s so true that some small changes can make a big difference! Thanks for your comment! Love this list. I am in high school but it it still applicable to me! Thank you! Such great tips! Really loved the one about doing the important things during your best hours. So key! This is me to a T! But I don’t feel highly productive. Sometimes I think I spend too much time on the planning part and not the “doing” part! Love the tips, thanks! I agree with all of them and I try to use them in my life. These tips somehow fit in my favourite way of working, supported by Kanban tool and simple paper calendar. Motivating article for the ney year! I’d like to piggy back on Janet Snow’s comments. When my kids were little I was very frustrated with not being able to get things done. One day I sat down and made a list of all the repetitive tasks I did each day to take good care of my 3 little ones. Then I added an estimated time for each task: change a diaper – 5 min. X 6 diapers/day = 30 min. ; nurse the baby 15 min. X 8 = 120 min. (these are just estimates). The point is that when I added all the minutes up, I found I was left with about 2 hours of time that wasn’t already spoken for (I included sleeping, eating etc.). It takes a lot of time and physical and mental energy to take care of children. But now that my kids are young adults, I have the reassurance of perspective behind my claim that you will either pay now or pay later. I poured my heart and soul into my kids when they were young. Their well-being and healthy development were my priorities. But now they’re happy, productive, stable, balanced, thoughtful members of society. They make me things, listen to my troubles, help with the garden . . . and, generally speaking, I have a lot of time to pursue other aspects of life. This list of 12 habits is great, and I will refer to it to get myself straightened out some days. But if you have children in your life, then maybe the first priorities for #3 could be the things you need to do each day for your kids, and then when you get to #12 you can celebrate that you’ve done the most important things that day whether or not the other stuff gets done. Great post! I appreciate Heather and Janet’s replies!! It is SO hard to take a step back and realize what you HAVE done, instead of focusing on what you haven’t! I couldn’t agree more! 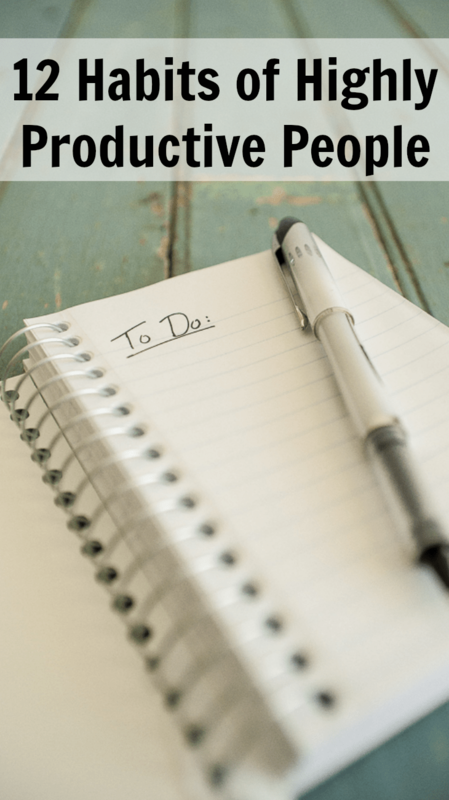 For me it’s been vital to keep a to-do list and prioritize; I try to do important things first, this way I’m not so stressed knowing that, if there was no time or I was too tired to complete my to-do list, at least I dealt with the key tasks. My bestie sent me the pin to this…because she knows me so well! Deep down, I want to do all 12 of these things, I truly do. But executing them escapes me. Just HOW do you get yourself to do these things if it doesn’t come naturally? Thanks for this list, it gives me something to work on and towards. It can certainly be challenging! My suggestion would be to take it one step at a time. Major lifestyle overhauls usually don’t stick unless they’re done incrementally. So maybe choose one area to work on for a few weeks. Then once you feel like it’s a habit, move on to the next. Good luck! Having two little ones has definitely scrambled my brains and I need to make a conscious effort to write things down and prioritize. I like #7 the best!! !